Electricity, in its most basic definition, is the flow of the mysterious things called electrons. This discussion will not go into the scientific detail about atoms, electrons or electrstaic charges. Electron flow through a conductor (wire, for example) is often illustrated as being similar to water flowing through a pipe or hose. Each drop of water could be considered an electron. Enough science!! Current is the term most often used when refering to the flow of electrons. The electrons can be forced to move either way through a conductor, depending on how they are being pushed along. 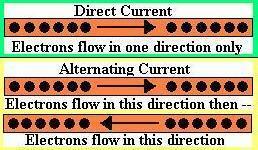 If the electrons are forced to move in one direction only, the current is called Direct Current (DC). When the electrons are forced to continuously change direction, it is referred to as Alternating Current (AC). The most common method to cause electron flow is to utilize a simple battery. A battery causes electrons to flow in one direction only, so it is a DC power source. Batteries are typically marked with a + side and a - side. Ben Franklin determined that electrons flow from the + side to the - side. (More on this later.) If the battery terminals were continuosly reversed (change polarity), the electrons would flow one direction and then reverse direction. If the process of changing battery polarity was continuous, Alternating Current is produced. Electricity can be produced with mechanical means, using a generator or alternator. These two terms are often used interchanged. A generator is a device that produces DC. AC is produced using an alternator. Remember Ben Franklin determined a long time ago that electrons flow from the positive (+) to the negative (-) terminal. Unfortunately, he was wrong and it was later discovered that electrons flow from the negative (-) to the positive (+) terminal. Because Ben was proven wrong, some confusion can occur. When the term conventional current is used, it refers to the flow of electrons as Ben Franklin determined it. The term electron flow current indicates true electron flow from the negative (-) to the positive (+) terminal.